Toronto could be about to get a new city beach and giant public fountain if plans for the 3C waterfront development continue as planned. New designs for the project led by Foster + Partners (of London's "Gherkin") released earlier this week by the development's landscaping team envision a new neighborhood on the vacant patch of land north of the Keating Channel, just east of the protected Victory Soya Mills Silos. Whisky Beach, a nod to the Distillery District to the north, will perch on the corner of an existing inlet to the west of the construction site, commanding sweeping views along the harbour to the Toronto Islands. Though the designs are preliminary, the public space appears to draw inspiration from Sugar Beach and HTO Park. Just behind the beach the landscape architects have designed a public space - dubbed Trinity Plaza - dominated by a 14-metre amber-coloured fountain. "Whisky Fountain," which, sadly, sprays water, is the centrepiece of the Trinity Street pedestrian extension under the Union rail corridor and Gardiner to the water. 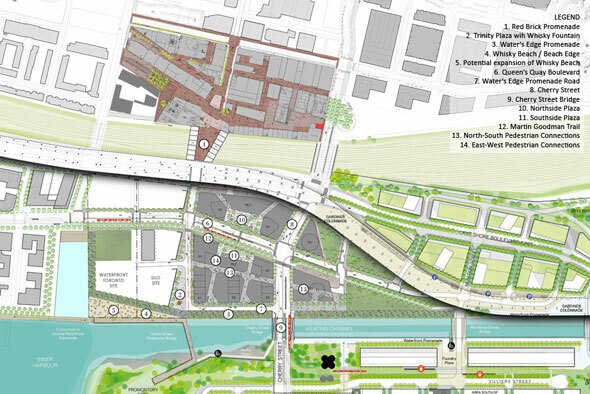 A public waterfront promenade is shown parallel to the Keating Channel, passing under Cherry Street toward the mouth of the Don. 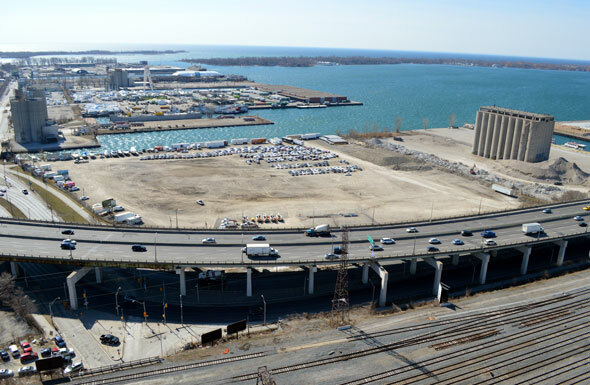 While Waterfront Toronto has a plan to transform much of the city's Port Lands area, this development is on private land and is being organized separately from the mass revitalization work planned directly to the south. That said, the designs will eventually be raked over by Waterfront Toronto's Design Review Panel in due course. It's also worth noting the designs optimistically show the East Bayfront LRT reaching the neighbourhood by the time construction is scheduled to wrap in 2020. It remains to be seen whether the unfunded separated streetcar route from Union to Cherry Street will get built. New transit taxes will likely need to play a role in order to get it built. Construction is still some way from getting started. The proposal is still awaiting the necessary bylaw appeals, which are scheduled to be heard in the fall. Details on the cluster of buildings, together comprising 2.4 million square feet of residential, office, and retail space, are not yet available. What do you think about the new look for the empty patch of land? Are you pleased the concrete silos will be kept? What about Whisky Beach and Fountain - does Toronto lack public water features?